While ketosis offers a ton of benefits to you while eating a keto diet, there are a lot of foods on the “don’t eat” list. It might be a little frustrating, but there’s an easy solution: keto cauliflower recipes. It’s not all about low carbs — you’ll need to eat plenty of healthy fats, too — but it’s easy to miss out on the key element of nutrient density. Without good minerals and vitamins from foods, you’ll probably feel even more fatigued and generally under the weather. Learning how to use cauliflower in keto recipes can be key to getting over that hump. 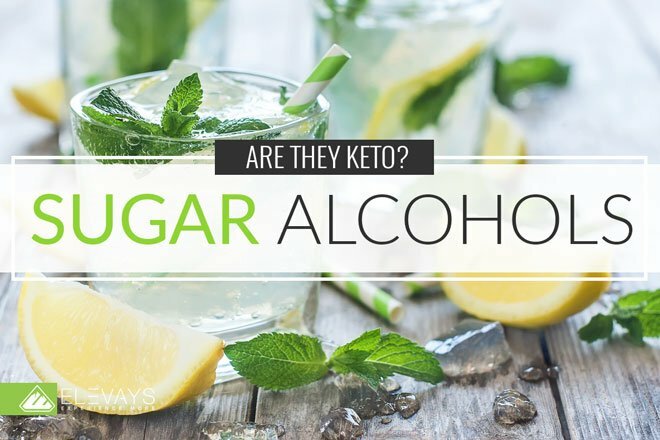 However, it’s also one of the most versatile foods you can have while on the keto diet. So, what makes cauliflower such an ideal keto food? WHY IS CAULIFLOWER THE PERFECT KETO FOOD? Let’s be honest… The keto diet is incredible, but there are some foods you might miss, especially at first. There’s a reason the internet is full of keto bread recipes! Cauliflower is the perfect keto food because it is versatile enough to sub for a ton of ingredients, fiber-rich and full of important vitamins and minerals. Sure, cauliflower is a low-carb food. But keto cauliflower recipes are popular because of the versatility of them. After all, do you know another type of food that can sub for potatoes, pancake batter, rice and pizza crust? Not only does cauliflower easily blend and mix with other ingredients, it has a very mild taste that tends to take on the flavor of whatever ingredients you mix with it. This one item can be used as a major part of both savory and sweet recipes — keto cauliflower “mashed potatoes” is just the beginning. What about cauliflower nutrition facts? Do the macros really line up with what you’re looking for on keto? That’s not the full list, but I’m sure you can see how beneficial a serving (or more) of cauliflower can be while you’re on keto. I hope you’re already convinced that cauliflower should always be on your keto shopping list. If not, though, I wanted to give you an outline of some of the most impressive benefits of cauliflower (on or off the ketogenic diet!). 1. CAULIFLOWER PROTECTS YOUR BODY FROM INFLAMMATION AND OXIDATIVE STRESS. When you think “antioxidants,” your mind might immediately think of colorful berries. But because it contains a pretty hefty serving of vitamin C, cauliflower is a great anti-inflammatory and antioxidant food (2). Why should you care about these ingredients? Foods high in antioxidants and anti-inflammatory nutrients help reduce processes that lead to disease. Not only can you help fight the madness of cold season with plenty of vitamin C, you can also give your body the best chance at long-term health with cauliflower and other antioxidant-rich foods. 2. EATING MORE CAULIFLOWER CAN HELP REDUCE YOUR RISK OF HEART DISEASE. A huge study covering the lives of over 134,000 women concluded that eating more cruciferous vegetables, including cauliflower, was associated with a lowered risk of death from heart disease and death from any cause (4). The way cauliflower reduces chronic inflammation may be the primary reason it’s so good for your heart, since too much inflammation throughout your life is very closely related to heart disease (5). 3. CAULIFLOWER MAY REDUCE YOUR RISK OF CANCER — AND FIGHT CANCER ONCE IT’S HAPPENING. While there’s no such thing as one food that miraculously cures cancer, there are many foods that have been proven in scientific research to both reduce cancer risk and possibly stop, slow, or reverse the growth of malignant cells. Cauliflower is one of those foods. Cruciferous vegetables (cauliflower, broccoli, etc.) help to actively prevent breast, colon, liver, lung and stomach cancers, with the most significant impact on breast cancer (6). Because of the numerous antioxidant compounds in cauliflower, it may also stop cancer cells from multiplying (7). Combine this with the incredible potential the keto diet has for preventing or slowing cancer growth, and you have just one more reason cauliflower is a perfect keto food (8,9)! Are you hungry yet? Great! Like I mentioned, cauliflower isn’t just great for one type of recipe. You can use it to recreate a keto-friendly version of, well, almost anything! Here are some of my favorite cauliflower keto recipes. First and foremost, you’ve got to have an incredible recipe for cauliflower mash, also sometimes called cauli-mash or keto mashed cauliflower. This recipe for The Best Cauliflower Mash Ever by The Healthy Foodie combats the sometimes too-soft or runny nature of making keto cauliflower mashed “potatoes” by squeezing water out of the cauliflower before pureeing it. To begin, steam the cauliflower for 8-10 minutes, then leave it to cool for just a few minutes. The Healthy Foodie recommends then squeezing it firmly through a sieve until no more water drips from the cauliflower. Then comes the delicious other ingredients! After adding mayonnaise, ghee, salt, pepper and nutmeg, you’ll churn the keto cauliflower mashed “potatoes” in a food processor until it’s creamy. To serve, add a little more ghee on top for that melted butter look and garnish with some chopped fresh herbs. This recipe for the best cauliflower mash ever yields about six servings and packs in over 19 grams of fat and 5.5 grams of protein, with only 9 grams of net carbohydrates! Pizza is one of those much-missed food items around my house, so figuring out how to craft a pizza crust that actually holds together and tastes great is a must-have keto recipe. That’s Low Carb came up with this keto cauliflower pizza crust recipe without any low-carb flours to keep it as simple as possible. All you need are cauliflower, eggs and parmesan cheese to make this pizza crust. The author recommends starting with pre-riced cauliflower, if you can. If not, you can use a food processor or “rice” it by hand to get the desired consistency (just be careful not to mash the cauliflower). Because you use parmesan cheese in the dough, it can be kind of sticky. Just keeping your hands wet from a faucet can make it easier to work with the dough. Once the ingredients are mixed, you simply spread the crust out in your desired shape onto parchment paper and bake for about 30 minutes. Then, it’s ready for toppings and a final bake! 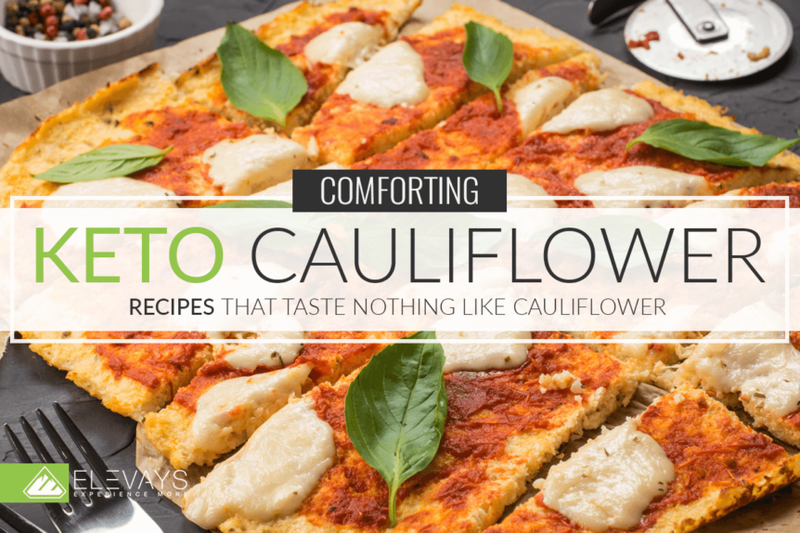 Similar to the process for making keto cauliflower pizza crust, many recipe creators have tried their hand at cauliflower breadsticks. I love this particular recipe for Cauliflower Crust Garlic Breadsticks by The Iron You because they look so darn crunchy and dippable! Plus, with the use of an egg, mozzarella cheese and olive oil, you’re getting an incredibly well-rounded treat that can be eaten as a keto snack or alongside an entree. Each breadstick contains 34 calories, 3 grams of fat, 2 grams net carbs and 2 grams protein. But, let’s be honest, are you going to stop with just one? Probably (hopefully) not. Don’t worry, it’s guilt-free! Eat your keto heart out. Building on the idea of keto cauliflower mashed potatoes, you can also replace your beloved “loaded baked potato” with a keto-friendly version like this Loaded Cauliflower Recipe by the Low-Carb Maven. Not only is this delicious bake full of nutritious cauliflower, it’s also got plenty of healthy fats in butter, sour cream, cheddar cheese and bacon. That’s my idea of a delicious comfort food! Like with the mashed cauliflower recipe above, you’ll need to steam the cauliflower, then drain it of any water before putting it in the food processor to get that fluffy texture. Add in butter, garlic powder and sour cream and continue to process, then put in chives and some of the cheddar cheese. The other half of the cheese, plus the rest of your chives and the bacon slices, go on top for the final bake. The author recommends microwaving this recipe, but if you’re concerned about microwaving killing off some valuable nutrients, you can prepare this in an oven pan as well. Serving six people, each serving of this loaded cauliflower contains 199 calories and just three net carbs. If you want to stick to the basics, cauliflower rice is definitely a great place to start. While it’s possible to buy pre-riced cauliflower, these options are often microwave-in-bag choices and can be hard to find in more organic options. Plus, it’s more cost-effective to make your own cauliflower rice — you can even freeze it for a quick, 5-minute side dish to any keto meal! There are a couple options to make this Easy Cauliflower Rice Recipe by Cook Eat Paleo. If you have a food processor, you can begin by pulsing it using your chopping blade. Then, switch to the shredding blade and continue running until the cauliflower is in small pellets, about the size of white rice. No food processor? You can grate your cauliflower rice by hand on a box grater, too. Once the cauliflower has been riced, you simply heat your chosen fat (I suggest olive oil or ghee) over medium heat, then saute the cauliflower rice about five minutes. Season as desired! Looking for more delicious keto breakfast ideas? Pancakes are another one of those recipes that many people crave when they first start the keto diet. And if you’ve kids going keto it can really pay off to have recipes like keto cauliflower pancakes available. Enter these Vanilla Cauli Cakes. By combining cauliflower with whey protein powder (or, for better macros, a keto protein powder that also incorporates healthy fats), you can come up with a fluffy pancake and flavor it any way you like. Using the author’s choice of protein, you’ll have a soft vanilla flavor, making this a lovely sweet breakfast option. To top off these pancakes, consider adding a dollop of ghee and a sprinkling of cinnamon! Even if you’re not doing keto, ditching the boxed mac and cheese is a great idea for your family’s health. But nobody really wants to say goodbye to the idea of that cheesy goodness forever… so here’s a recipe for Keto Cauliflower Mac and Cheese! The real magic of this recipe is the crushed pork rinds on top to imitate the bread crumbs many a southern grandma uses to complete homemade macaroni and cheese. One generous serving of this cauliflower macaroni and cheese affords a whopping 25.5 grams of fat, 16.5 grams of protein and only 5.5 net carbs. For a cruciferous veggie boost, try this Cauliflower & Broccoli Tuna Bowl. With broccoli, cauliflower, tuna, and some optional tahini tamari paste, this recipe is sure to provide a unique and fun taste while on the keto diet. After roasting the vegetables, add the tuna and make the paste to go on top. It’s that simple! Because tuna is a very protein-rich seafood, this dish has a ton of protein (47 grams per serving! ), so you’ll want to watch your protein intake the rest of the day to keep your macros balanced. However, you’ll still get 20 grams of fat and 12 net carbs from a full bowl. Creativity is the word of the day with this recipe for Bacon Kimchi Cauliflower Fried Rice. Kimchi is an incredible fermented food that provides you with useful probiotics in every yummy bite. Loading up this delicious fried rice dish with bacon, eggs, sesame seeds and green onions rounds out an incredible tasting dish with only 20 minutes of prep and 15 minutes to cook. I would avoid soy sauce, as soy is a known endocrine disruptor, and opt for coconut aminos instead. Need a good Game Day snack but don’t want to take a flex day from keto? Try these awesome Low-Carb Cajun Cauliflower Mini Dogs! The dough for these dogs is made using cauliflower with coconut flour, eggs, cheese (optionally), a fat (butter or coconut oil) and a variety of spices for flavor. I know coconut flour is often a little high in carbohydrates for many keto recipes, but this one uses very little and it serves just to work out the texture. Each serving of these mini-dogs (two dogs) is 137 calories with 7.5 grams of fat, 8 grams of protein, and only 1.7 net carbs. Missing your weekly sushi date? No worries — there is a keto-friendly option using, you guessed it, cauliflower! While you can make virtually any kind of sushi substituting cauliflower rice, this Simple Keto Sushi recipe takes on the famous California roll. To keep the cauliflower rice together, the author suggests coconut oil as a binder. You can also bind the rice using additional cream cheese, if you prefer. Half of this sushi roll can provide over 22 grams of fat but only contains about 4 net carbs. Again, I recommend coconut aminos as the dipping sauce, rather than soy. This collection of keto cauliflower recipes has probably made your mouth water! Hopefully, you can see that there are many creative options beyond the typical cauliflower mash that allow you to take advantage of this keto friendly food. What are your favorite keto cauliflower recipes? Is there one on this list that you are dying to try? We’d love to hear from you! Leave us comment below!